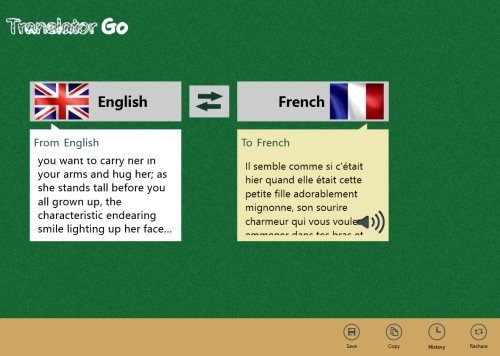 Here are 4 free Windows 8 language translator apps that let translate text from one language to another, within the app. Here, you get a wide range of different languages to which you can convert text to. It’s a very easy and simple to access these language translator apps and it takes a few seconds to translate text. Language Translator is a free Windows 8 language translator app that lets you get accurate translations in a desired language. This language translator app for Windows 8 brings you a wide range of languages such as French, Dutch, German, Greek, Hebrew, Hindi, Italian, Japanese, Korean, Russian, Turkish, Thai, and many more. The interesting thing is that you can also listen to the audio of the text you translated in a different language. This way you can learn how to pronounce a particular phrase in that language. It’s very easy to convert a text in a different language. All you need to do is just copy paste the text ? select a language to which you want to translate and finally click on ‘Translate’. You will get the result instantly. Go ahead and download Language Translate app powered by Microsoft Translator. Language Translation is a little yet powerful language translator Windows 8 app that lets you translate between two or more languages, right there. It comes with a simple interface where you need to just paste or write the text that you want to translate ? then select a language to which you want to translate.. there you go. You will get the translation in the next second. With language translation apps, you do not need to look for translations over the web. Just get Language Translation app and make translations easier. This Windows 8 language translator app comes with a wide range of languages such as Afrikaans, Albanian, Arabic, Bengali, Chines, Danish, Dutch, Finnish, German, French, Hindi, Irish, Latin, and many more.. the list goes on. Go ahead and download Language Translation app in Windows 8 now. Also, check out our posts on eBook Apps, Horoscope Apps, and Dictionary Apps. 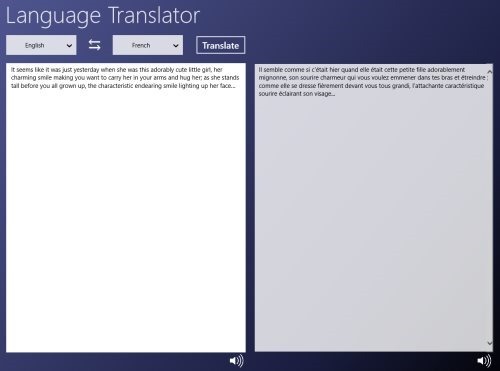 Yet another popular language translator app for Windows 8, Translator Express translate a phrase, a sentence, or just a word to a different desired language. Languages such as Arabic, Bulgarian, Catalan, Czech, Danish, German, French, Hebrew, Italian, Korean, Polish, Spanish, Turkish, Ukrainian, and more. You can also copy the result and can paste it where you want – in your article, a spreadsheet, a note, or anywhere. There is a ‘Clear All’ option given that lets you clear out the entire text right away. The interesting thing is that you can also share the translated text to other apps, from within the Translator Express app. It’s a good utility Windows 8 app to carry out translations between multiple languages. Go ahead and download Translator Express in Windows 8 now. Ending my post with Translator GO! which is quite interesting. This Windows 8 language translator supports translation between various popular languages, covering the entire world. The unique part about this translator app is that while selecting languages, it does not show a list of languages (like all other apps do). Instead, Translator GO! takes you to a page where you will see languages given along with Flags and you need to select one. You can also flip between the languages instantly using the flip-like icon. In addition, there are functions such as Save, Copy, History, and Reshare. You can save the translated text, copy the text, check the history of your translations, and share the translated with other apps, from within the Translator GO!. One thing which did work was the Audio option. Nonetheless, I liked the app a lot. Go ahead and download the app in Windows 8 now.